I don't understand who thought this movie was a good idea, and I don't understand why anyone involved with this movie thought it was funny. With comedy stars Kevin Hart and Tiffany Haddish leading this film, it had potential to be funny and charming. Kevin Hart (Jumanji: Welcome to the Jungle, 2017) and Tiffany Haddish (Girls Trip, 2017) are both very successful stand-up comedians, and deservedly so. 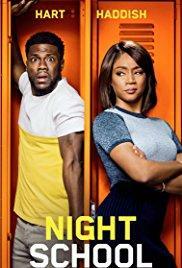 Kevin Hart plays a sly, working-class salesman who dropped out of high school and then returns to the classroom in his adulthood to earn his GED. Tiffany Haddish plays the stern, brassy teacher who helps Kevin Hart's character learn to stop cutting corners and work hard. I watched this movie in the theater with an audience of regular people, and numerous punchlines from this film were met with silence. And I'm talking total silence from the whole audience. The awkward, elongated silence of disaster. Some parts stirred up laughter with the audience, so there were some good reactions peppered here and there. But this story has been done so many times in so many other movies. Like Back to School with Rodney Dangerfield from 1986, or 21 Jump Street from 2012, and even more recently with the Melissa McCarthy film Life of the Party that was released earlier this year. This story has been done so much, that Night School ended up being predictable, vapid, and boring. Can the director and screenwriters go back to school now to create something better next time?